Here at The Bike Insurer, we place a lot of emphasis on driver training and learning but if your equipment isn’t up to scratch, it doesn’t matter how experienced or how good you are – you could still come a cropper. It’s the same for any pursuit and any sport, like the golfer with the outdated driver or the tennis player with the wooden racket, technology moves forward and if you don’t, you will be left behind. In terms of motorbikes, the wrong or outdated equipment won’t result in defeat, it’s your life that’s on the line instead, which is why it’s important that you buy the right gear and the right equipment. And there is no more important piece of equipment than your tyres. When you think about it, tyres are the most important parts of your bike. They’re the only parts of your bike that you want touching tarmac and the parts that respond to both the road surface and your actions on the bike. They’re under constant pressure and don’t even get a break when your bike is parked up, so it doesn’t make sense to buy the cheapest or take a chance on their condition. When you buy a new motorbike, the tyres it comes with will have been picked and decided on by both the tyre manufacturer and the bike manufacturer. That means they will be the optimum tyres for that bike in terms of size and type, thus providing the best drive and braking distances. This will correlate to the information provided in your owners’ manual. It will show the correct size and correct pressure of your tyres for optimum riding. 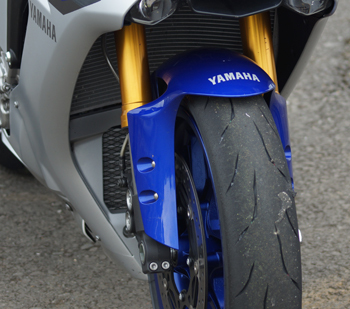 You should never change the size of your motorbike’s tyres without consulting an expert as it can dramatically change the balance of your bike. You should also try to keep your tyres pressure as close to the manufacturer’s guidelines as possible, which means regular tyre pressure checks. Also important is to regularly monitor your tyre’s tread depth – those slashes and grooves in your rubbers can be the difference between a slight skid and completely ditching your bike. Tread depth – What’s the law? Your motorbike tyres should never have a tread depth of less than one millimetre across the middle three quarters of the tyre or, as is more applicable to motorbike tyres generally, the original grooves must have a minimum depth of at least one millimeter. If you keep your tread above this limit, you won’t fall foul of the law, however you will notice a significant drop in your tyre’s performance if you allow the tread to drop this low. If not one millimetre, when should I change? The legal limit is one millimetre however this figure should be viewed as an absolute minimum and we would advise changing your tyres before they get this low. If your tyre is below two millimetres of tread then you will notice that your tyres have flattened out and they no longer hold a rounded profile. This will result in poor handling and will also heighten the chances of a puncture. We would advise changing at 2.5mm, particularly heading into autumn and winter when UK roads are wet and greasy. In theory, you’re supposed to check your bike’s tyres every week, looking at their general condition, tread depth and any signs of damage or abnormal wear. 1. If the tyre is punctured. 2. If the tread depth is below the legal limit. 3. If the tyres show signs of ageing. 4. If the tyre is damaged. 5. If the tyre shows abnormal wear. 6. If the tyres are not the right size for your motorbike. Can I repair my motorbike’s tyres? Yes however in some cases you can not as they are deemed irrepairable. 1. There is a puncture in the sidewall. 2. Bead wires are visible or distorted. 3. The tread has become deformed or separated. 4. The fabric beneath the rubber is visible. 5. They have been damaged by corrosive substances. 6. The outside of the tyre has been damaged by riding on under-inflated tyres. Buying new tyres – what should I go for? When buying new tyres for your motorbike, it’s important to be ruled by factors other than price. While it’s tenmpting to buy the cheapest rubbers to get you road-legal, they can be the difference between life and death as the only point of contact with the road’s surface. As such you should not take any chances. 1. Buy tyres in matched pairs – from the same manufacturer with the same tread pattern. 2. Shop around – don’t buy the cheapest set available but remember that different shops will sell at different prices, so do your research. 3. Seek advice – if you’re not an expert, try to find someone who is. Whether that’s a more experienced rider or a forum on motorbike websites, get first, second and third opinions before taking the plunge. 4. Avoid part-worn – part-worn tyres are cheaper but that’s because their working life will be shorter. There are also no guarantees as to their performance, unlike new tyres from notable retailers and manufacturers. 5. Get a mechanic to fit them – you could spend a lot of money on new motorbike tyres so don’t waste all the money by trying to fit them yourself and mucking up. Get a trained mechanic to do it for you. When you buy new trainers you don’t go out and run a marathon straight away in them because you’re likely to get blisters. It’s the same with new motorbike tyres, but instead of blisters you could end up with road rash or worse. You must break your tyres in. That means around 100 miles of riding before you should properly open your bike out, brake harshly and corner hard. You should also use this time to get used to the different feel your new tyres will give and clean the tyres of any lubricants, stickers or adhesives with a rough, dry cloth.